When you assemble a group of people with modified motors and ask them to drive at high speeds around a circuit of sharp turns and tight corners, accidents and injuries seem unavoidable. Despite this, motorsport accidents are infrequent, though they can be serious when they occur. Toni Murch, MCPara, HCPC registered paramedic and business development manager at Celox Medical, recounts one incident where effective haemorrhage control was critical for survival. Motorsport is one of the most popular sports in the United Kingdom, with the Motor Sports Association (MSA) issuing permits for approximately 5000 events each year. With 29 active permanent circuits around the country and televised races attracting thousands of viewers from around the world, the UK is undoubtedly one of the most active territories in motorsports. While racing venues uphold very high safety standards and employ trained emergency medical personnel for races, accidents still happen. The critical factor is the speed and effectiveness of medical staff to respond when an accident occurs; something that can be a matter of life or death. Celox Medical, a global brand by Medtrade Products Ltd, is established for its innovation in the field of pre-hospital haemorrhage control. A result that stems from the company’s commitment to continue monitoring and assessing the safety and performance of its products, once these are released in the market. 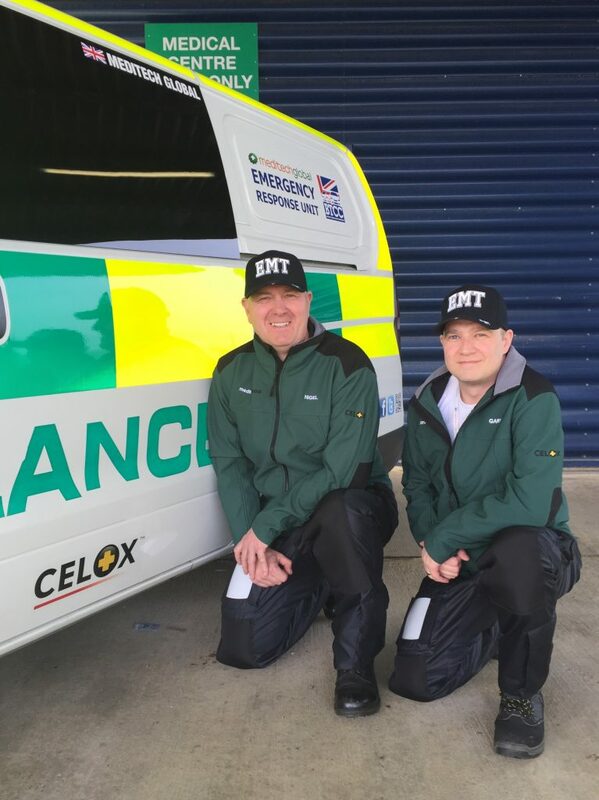 For example, several medical support teams at motorsport venues around the UK carry Celox products to provide fast, effective haemorrhage control, with Celox Rapid being the fastest acting haemostatic gauze1. 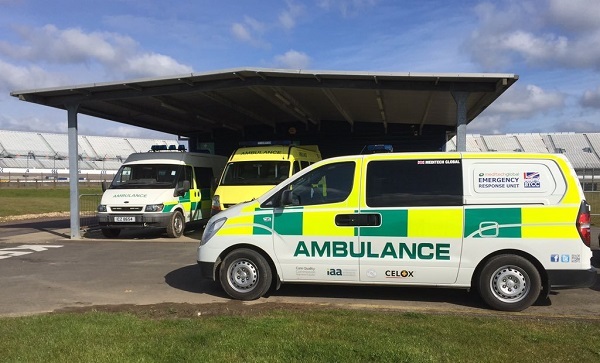 Meditech Global, the trackside emergency ambulance provider at the Rockingham Speedway, recently reported a prime example of how its paramedics used Celox to save the life of a motorcycle racer. During a race, a fault with a motorcycle’s braking system developed. Unable to slow down, the racer turned through a high-speed corner and lost control of his bike. The momentum forced both the racer and his vehicle from the track, propelling them through the air until the rider thumped into the gravel with his legs in the splits position. The speed and force were so intense that the rider continued through the air before crash landing on the Armco barrier. While it was a relatively rare type of accident, it was extremely challenging to treat. The racer had suffered an open complicated fracture with a femoral laceration on the upper thigh and multiple fractures to his femur and pelvis. These fractures meant that the use of a tourniquet, which for many emergency responders is considered the first step when trying to control bleeding, was no longer an option. Failure to stem the flow of blood from the laceration would result in the racer bleeding out. Time is of the essence with arterial bleeds, particularly as the time to treat after a motorsports accident is often not immediate. There was an unavoidable few minutes delay between the accident and emergency responders arriving at the scene due to the need to stop the race and clear the lanes. With a two-minute haemorrhage already a reality, emergency treatment needed to be done quickly to stop the arterial bleed caused by the laceration. The emergency responder on the scene immediately turned to Celox and reported that the chitosan-coated gauze, stopped the arterial bleeding within three minutes. Given the severity of the wound, the air ambulance transferred the patient to Coventry emergency hospital. A 12-minute, high pressure, high vibration journey, with air-medics potentially ready for another haemorrhage situation on the flight. Celox kept the wound sealed without any re-bleeding on route from the raceway to the emergency hospital. The patient arrived safe and was taken straight into the operating theatre and was successfully treated. Without an effective haemostatic gauze on hand to provide fast haemorrhage control, the story could have ended very differently. Fortunately, the emergency team had Celox on hand to act quickly and properly. A haemostatic gauze like Celox can treat life-threatening bleeding fast2, without the need for a tourniquet and, for Celox Rapid, with only 60 seconds compression, or until bleeding stops2. Life-threatening accidents are fortunately rare, but accidents do happen in motorsport. For the emergency services responding to these accidents, speed is as important for treatment as it is for the racers competing. It’s important that emergency responders have the fastest acting products available to ensure as many people survive as possible. 1. Supporting information available upon request. 2.. Hoggarth A et al. (2011). Testing a new gauze haemostat with reduced treatment time. Poster at ATACCC, Ft Lauderdale, August 2011.